This paper describes the methods and results of the Norwegian Mastitis Control Program implemented in 1982. The program has formed an integral part of the Norwegian Cattle Health Services (NCHS) since 1995. The NCHS also have specific programs for milk fever, ketosis, reproduction and calf diseases. The goal of the program is to improve udder health by keeping the bulk milk somatic cell count (BMSCC) low, to reduce the use of antibiotics, to keep the cost of mastitis low at herd level and improve the consumers' attitude to milk products. In 1996, a decision was made to reduce the use of antibiotics in all animal production enterprises in Norway by 25% within five years. Relevant data has been collected through the Norwegian Cattle Herd Recording System (NCHRS); including health records since 1975 and somatic cell count (SCC) data since 1980. These data have been integrated within the NCHRS. Since 2000, mastitis laboratory data have also been included in the NCHRS. Data on clinical disease, SCC and mastitis bacteriology have been presented to farmers and advisors in monthly health periodicals since 1996, and on the internet since 2005. In 1996, Norwegian recommendations on the treatment of mastitis were implemented. Optimal milking protocols and milking machine function have been emphasised and less emphasis has been placed on dry cow therapy. A selective dry cow therapy program (SDCTP) was implemented in 2006, and is still being implemented in new areas. Research demonstrates that the rate of clinical mastitis could be reduced by 15% after implementing SDCTP. The results so far show a 60% reduction in the clinical treatment of mastitis between 1994 and 2007, a reduction in BMSCC from 250,000 cells/ml to 114,000 cells/ml, and a total reduction in the mastitis cost from 0.23 NOK to 0.13 NOK per litre of milk delivered to the processors, corresponding to a fall from 9.2% to 1.7% of the milk price, respectively. This reduction is attributed to changes in attitude and breeding, eradicating bovine virus diarrhoea virus (BVDV) and a better implementation of mastitis prevention programmes. Mastitis is defined as any inflammatory process affecting the mammary gland . Clinical mastitis (CM) is defined as mastitis causing clinical signs in the udder or visible changes in the milk and according to the recommendation of the International Dairy Federation (IDF), is divided into severe, moderate or mild . In the Norwegian recording system, moderate and severe CM is reported using the same health code: 303 . Subclinical mastitis is only detected by laboratory methods such as the analysis of somatic cell count (SCC) or other parameters related to the inflammatory process. The main motivation for mastitis control is an economic one as stated by Morris . Little scientific work has concentrated on the subject of economics and mastitis, although the IDF has tried to summarise its relevance . The subject was also discussed in a recently published review paper . The data revealed a large variation in the calculated costs and benefits of mastitis and mastitis management between the different studies. In addition to this, it is clear that important factors were ignored in some of the studies. As economic gain is a major goal, economic parameters must be included when mastitis control programmes are evaluated. In Norway, the costs of mastitis are calculated and presented for each farm during each recording period (Table 1). Other important parameters are animal welfare and farmer welfare. Most clinical cases of mastitis are painful for the effected animal and create a lot of work for the farmer. Subclinical mastitis may also be painful for the cow . Mastitis causes changes in milk content and characteristics such as shelf life and properties for cheese processing . Therefore, dairy processors offer quality payments for a low content of inflammatory parameters in the milk (e.g. SCC). The absence of careful mastitis control, for example when aiming only at reducing the SCC, might lead to huge costs of extra treatment and culling at farm level. Economic analysis should therefore include all of the important issues in mastitis control, for example milk quality, production loss, discarded milk, treatment and replacement cost etc.. Other goals are to minimise the risk of producing milk being contaminated with pathogens or toxins that are a hazard to human health (Streptococcus agalactiae, Staphylococcus aureus toxins, Listeria spp. etc.) and to eliminate, as far as is possible, specific highly pathogenic strains of bacteria, or bacteria that are carriers of resistance genes. The presence of these bacteria has demanded a continuous need for new and sophisticated antibiotics and they might cause transfer of pathogens or resistance genes into the human food chain, which may influence consumer attitude towards milk . As most pathogens involved in mastitis are common in the dairy cow environment, it is not economically feasible to try to eradicate mastitis. Pathogens like Mycoplasma bovis and Streptococcus agalactiae are not usually found in the environment of the cow and would be easier to eradicate. Mastitis could, however, be controlled more successfully than is currently being achieved. A full-scale mastitis control programme has to include information on the prevalence of the pathogen to be controlled. The pathogen involved must be recognised to know how best to control its spread and pathogeneses. Exact knowledge should be based on unbiased research. Finally, there is a need for personnel and resources to provide information and carry out advisery work. Motivation is also vital to encourage and assist the farmer or herds-person to make the correct decision at the correct time. The aim of this paper is to describe the methods and results of the Norwegian Mastitis Control Programme implemented in 1982. Mastitis diagnosis is achieved by the recognition of clinical signs by farmers and/or veterinarians, supplemented by cow-side tests like the Californian Mastitis Test (CMT), and supplemented with bacteriological tests like Limulus  and/or culturing on different agars such as SELMA or SELMA PLUS (SVA, 2008). Our experience is that this is costly and gives little useful information without knowledge of the total health status at cow or herd level. Our aim is to accumulate useful information over time, and to use it at herd level to reveal which pathogen is involved in a particular herd in clinical as well as subclinical cases. The information is used to develop a control and treatment programme adapted to specific farms and specific pathogens. Since 1996, such information has therefore been included in the NCHRS and presented in the health periodical together with information on cow milk somatic cell count (CMSCC) and clinical disease (Figure 1). Since 2005, this information has also been available on the internet for farmers, advisers and veterinarians. This is the reason why Norwegian veterinarians have been encouraged to send mastitis samples to the authorised mastitis laboratory for bacteriological investigation rather than performing this investigation themselves. 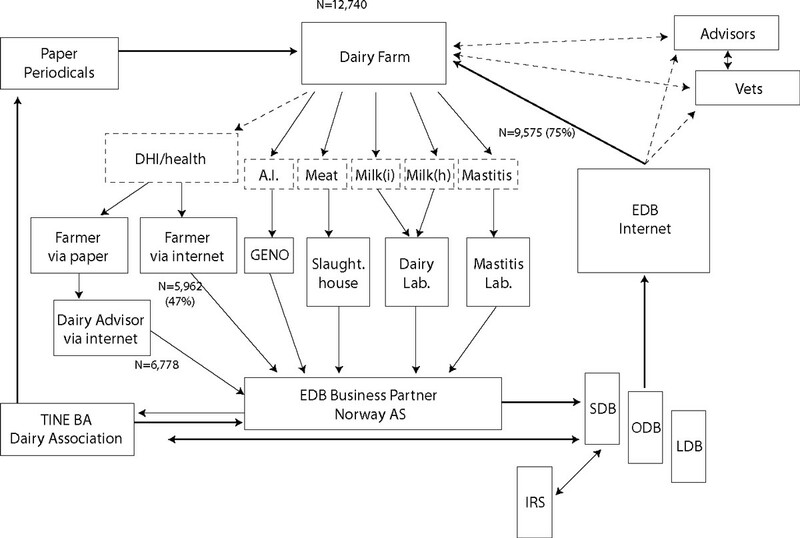 Data flow-chart illustrating the integration of all relevant information in the Norwegian Dairy Herd Recording System (NDHRS). DHI/health = Dairy herd improvement system including health records; AI = artificial insemination; Geno = Geno breeding and AI association, Norway; Milk(i) = Individual milk samples within NDHRS; Milk(h) = herd bulk milk samples within dairy processors; SDB = Dairy Cattle Data Base; ODB = Bull (Ox) Data Base; LDB = Delivery Milk Data Base; IRS = Official Individual Record System; TINE BA = TINE BA Norwegian Dairy Association. N indicates number of farmers using this path. In 1975, Norway introduced a requirement to keep records of mastitis treatments , probably the first country worldwide to do so. Computerised records were kept to assist the control of certain reproductive disorders and also to assess whether an association between breeding for higher milk production and mastitis existed. From 1978, focus has been on CM resistance in the Norwegian Cattle Breeding Programme . Since 1992, there has been greater focus on mastitis than on milk yield. All historical records on clinical mastitis, CMSCC and milk yield as well as bacteriology are now available for analysis at both herd and individual cow level. This allows feed-back to farmers and advisers on how different environmental changes and treatment protocols work on a specific farm. Subclinical mastitis is recorded as SCC usually either at cow (composite) level (as CMSCC) or at bulk tank level (as BMSCC). These records became available from the late 1970s or early 1980s. From 1975 to 1979/80, testing was performed by the mastitis laboratories twice a month using a coulter counter. However, since 1980, CMSCC has been measured every second month or every month and BMSCC four times a month using fossomatic (Foss, Hillerød, Denmark). All information was incorporated into the NDHRS (Figure 1). The most important result of this is that the information on consecutive analyses is mathematically transformed to geometric means, sorted according to importance, and presented in a more useful format so the data can be used directly in the herd and at cow level for analyses in a problem solving process as well as for prognostics and diagnostics at cow level. Use of the internet makes these data available within a few seconds. Data can be accessed detailing animal identity, parity and history of individual cow somatic cell counts; results from bacteriology sampling; as well as key fertility, health and treatment data. At cow level, information on diagnostics can be used to predict the prognosis both pre- and post-treatment for different cows within a herd, according to expected cure rates after therapy or no therapy, and hence to select cows for bacteriological culturing of milk samples to add more information to the system. Cows can then be selected for dry cow therapy, culling at the optimal lactation stage, breeding etc. . Finally, the information can be used to identify milk to be discarded from high SCC cows for delivery to the dairy processor. The importance of such selection to keep the BMSCC low is demonstrated by Østerås . CMSCC together with available bacteriology is thus the most important decision-making tool in the daily dairy herd management of mastitis. At herd level the information can be used to analyse herd characteristics, for example new infection rate, incidence of clinical cases, duration, prevalence etc. (Table 2) and the economic impact of mastitis in that herd. Intervention can be made as early as possible based on this information to avoid further financial loss. Example of estimated herd characteristics presented on the herd periodical each month when somatic cell count is analysed. Number of cell count recordings during the period. Prevalence of SCC > 200,000 cells/ml (%). New inflammation >200,000 cells/ml (%) (corrected to 6 analyses). Duration estimated in months (corrected to 6 samples). Mastitis - number of cases per cow-year. Ketosis - number of treatments per cow-year. Milk fever - number of treatments per calving after 1st parity. Reproduction treatments -number of treatments per cow-year. Standardised reproduction number (FS) (country = county). Calves < 6 months - number of treatments per half-year. Norwegian mastitis control has followed the main principles stated by Dodd  and Morris . An effective mastitis control programmeme should aim to reduce the new infection rate. Morris  questioned the use of introducing a duration of infection criterion as suggested by Dodd . Morris  argued that although the term duration is easily comprehended, it is very difficult and time-consuming to measure in a significant population of animals. With new computer technology, the Norwegian recording system is calculating both the new infection rate based on CMSCC and CM records as well as the duration during the last 12 months, during each reporting period (12 months) for each herd. The variables are described in more detail by Valde et al. . The duration is simplified according to Dodd's equation; the prevalence equals the new infection rate multiplied by the duration. An example of a report with prevalence, new infection rate and duration is presented in Table 2. The programme will be adapted to the figures of new infection rate or duration. If the new infection rate is relatively high, more emphasis will be put on correction of the environmental management and the milking protocols. If duration is relatively high, more emphasis will be placed on therapy or culling. Careful removal of clusters (air inlet and over milking). Proper capacity, dimension and slope of pipelines (impacts). Proper bedding area (animal welfare, hygiene). Avoiding buying animals from other herds, or careful screening of health status in their herd of origin (bio-security). Therapy at an appropriate time and of the correct cows (dry cow period, S. aureus and Streptococci). Segregation (for unpromising cases until slaughtered). All points should refer to the actual pathogen present on the farm being considered. This means, you must know the pathogen(s) involved in the mastitis problem, both at herd level as well as at regional and national level. Pathogens involved may be different from herd to herd and from country to country, and may change over time . This is probably caused by changes in the cow's environment and treatment pressure. In Norway a survey carried out during the year 2000  gave highly relevant information for the implementation of new strategies. Staphylococcus aureus is the most prevalent mastitis pathogen. However, half of the isolates were associated with fairly low CMSCC and the incidence of CM was only slightly increased in cows infected with Staphylococcus aureus . Milk yield was higher just after calving, but reduced later in lactation . The prevalence was highest at the start of the first parity and lowest in the second parity. The prevalence of Staphylococcus aureus decreased during lactation while Streptococcus dysgalactiae increased. There was also a strong seasonal effect, with a higher prevalence during the late indoor season and the summer compared with the autumn . The survey illustrated the importance of good information before implementing a control programme. The control programme will have to be changed over time, and also has to be different from country to country because of differences in cow management and the prevalence of the various pathogens. Under Norwegian conditions, much more focus than before should be put on heifer environment, as well as feeding around and before calving. Appropriate risk factors are highlighted in papers by Valde et al. and Waage et al. .
Research has documented that it is possible to breed for a higher resistance to mastitis . Heritability is found to be 3-5% for CM and approximately 15% for SCC. Many countries have included SCC in the breeding index, but Norway has only included CM. To achieve progress with traits of low heritability, it is important to work with large daughter groups which provide more precision in the selection of bulls, despite a low heritability of the trait. As there is a negative genetic correlation between CM and milk yield, sufficient weight has to be put on mastitis to get a positive effect. The Norwegian breeding programme is probably the only programme to have placed sufficient weight on CM to get a net positive effect reducing mastitis incidence in the population. The Norwegian breeding programme aiming towards a higher individual resistance against CM is an integrated part of the Norwegian mastitis control programme. Some pathogens are more likely to cause clinical signs of mastitis (Escherichia coli), while other pathogens usually cause subclinical infections (S. aureus and CNS). New research comparing two selective genetic lines of cattle, one for high yield and one for high resistance against CM illustrate a large selective effect with a difference of 10% in CM after only five generations . There is a significant correlation between selected other diseases and mastitis. This means that the control of mastitis can be even more effective if relevant diseases are included in the control programme for e.g., BVDV, milk fever, reproductive disease and ketosis. It is documented that a herd newly infected with BVD virus suffered a 7% increase in the risk of CM due to the effect on the immune system during the infectious stage of the disease . When starting the BVD eradication programme in Norway in 1992, the prevalence of BVD was 26% of herds being sero-positive on bulk milk tank samples. In 2004, there were only three herds still under restriction, due to possible infected animals. The last animals persistently infected with BVD virus were slaughtered during summer 2006. The entire Norwegian cattle population has been tested and known to be free from BVD virus since. This has had a positive effect on the results of the mastitis control programme. The Norwegian mastitis control programme is different from the five point plan as there has been very little dry cow therapy and only approximately 12% of the herds have practised regular teat dipping. Reasons for this are that dry cow therapy was almost 'banned' from the Norwegian School of Veterinary Science in the 1960s and 1970s. Selective dry cow therapy has been implemented since 2005 using the information system in the selection process. All cows with more than 100,000 cells/ml CMSCC during the last three samples before drying off are recommended to be selected for bacteriological testing. Those which are positive for S. aureus, S. dysgalactiae or other major pathogens should receive dry cow treatment. No treatment is recommended if CNS is identified. Cows with high CMSCC (above 600-700,000 cells/ml) and with major pathogens should be culled at the most economically advantageous time during their lactation. The programme is scientifically based on the estimated probability of success or failure according to Østerås et al. [12–14], and Østerås and Edge [28, 29]. At present about 0.05% of Norwegian cows receive dry cow therapy. According to our data, approximately 35% should be sampled and of those 35-40% should be assessed for dry cow therapy. There is, therefore, a need for dry cow therapy in approximately 10% of Norwegian cows. The latest dry cow therapy programme has documented that this will contribute to a further 15% decrease in CM . The limited use of teat dipping is due to the traditional way of thinking in Norway; that teat dipping would be detrimental to minor pathogens and normal commensally skin bacteria and hence ease the colonisation by pathogens like S. aureus. Results from a large project in 164 herds on evaluating the effect of teat dipping, showed no effect on the incidence of S. aureus. infections although a significant reduction in S. dysgalactiae infections was seen . The results of the Norwegian mastitis control programme are illustrated in Figure 2 and Figure 3. There has been progress in reducing BMSCC between 1980 and 2002, and thereafter a slight increase. CM has decreased since 1994. Since 1985, the BMSCC has fallen, but clinical cases increased until 1994. 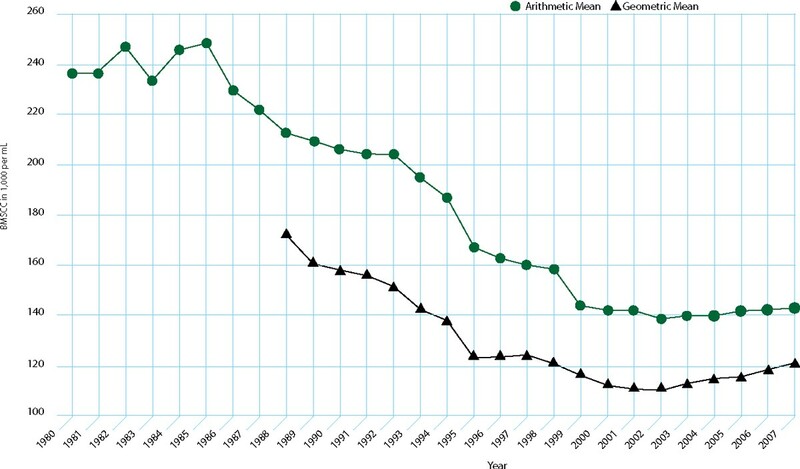 Figure 4 illustrates that the economic loss due to mastitis in Norway decreased between 1991 and 2004. The main reason for this is reduced loss due to CM and reduced production losses. The rate of CM can be reduced further so long as the production and replacement loss does not increase. This will be followed closely and is an important part of the management of mastitis control in the country and regions. The incidence rate per cow-year of a cow being treated for all types of clinical mastitis, severe/moderate clinical mastitis, mild clinical mastitis, teat injuries and dry cow therapy, per year from 1975 to 2007. The bulk milk somatic cell count (BMSCC) in Norway from 1980 to 2007 expressed as both arithmetic and geometric mean. Estimated total loss from mastitis in Norway from 1988 to 2004 divided according to type of loss and in total øre (NOK/100) per litre of milk delivered to the dairy processor. A computation system shift was made in the year 2000 indicated with open space and a higher level in the year 2000 compared to 1999. The blue line indicates loss per litre, bars indicate total loss divided by loss due to quality (lost premium), production loss, clinical mastitis, and replacement cost. The survey in the year 2000 identified the cow level prevalence to be 22.2% for S. aureus, 2.8% for penicillin G resistant S. aureus, 3.8% for S. dysgalactiae, 0.0% for S. agalactiae, 5.7% for CNS and 8.8% dry quarters. Thus, the proportional rate of S. aureus showing resistance to penicillin G has risen from 10.5 to 12.6%. For samples taken from CM cases, we typically find 49.8% of cows with S. aureus, 4.1% with penicillin G resistant S. aureus, 17.3% with S. dysgalactiae, 6.4% with coliforms and 7.7% with CNS. The same prevalence at quarter level is 16.6 to 22.8%, 1.2 to 1.6%, 4.2 to 6.3%, 1.6 to 2.0% and 1.8 to 2.8% respectively, depending on quarter site. The proportional rate of penicillin-resistant S. aureus is 8.2% at cow level and approximately 7% at quarter level. Figure 4 illustrates that the economic benefit of this work has a value of 0.10 NOK per litre of milk delivered to the dairy. In Norway this comprises a total of 150 million NOK, or approximately 40% of the level in early 1990's. More detailed analyses of the economic benefit of the control programme illustrates that of the total benefit between 1990 and 1994 was only 17 million NOK. Of these eight million NOK was generated from payment for improved milk quality and 24 million NOK from reduced production loss related to lower SCC but an extra loss of 11 million NOK from increased clinical treatments (both veterinary fees and discarded milk) and finally another extra loss of four million NOK from increased replacement rates due to mastitis. Between 1994 and 2004, after the change in treatment strategy, the total gain achieved as a result of implementing the mastitis reduction programme was 173 million NOK. Two million NOK was generated from better quality payment, 55 million NOK from reduced production losses related to lower SCC, 106 million NOK from fewer clinical treatments (both veterinary fees and discarded milk) and finally 10 million NOK from reduced replacement rates as a consequence of mastitis. It is obvious that the treatment strategy implemented to lower the BMSCC during the 1980s was counter-productive from an economic point of view, as the extra treatment and culling costs negated much of the gain achieved from the large improvement in BMSCC. The new strategy, implemented in 1994, has been successful in reducing the treatment cost of more than 100 million NOK, without any adverse effect on milk quality or BMSCC. The Norwegian mastitis control programme has resulted in significant progress and the extra money earned has been approximately 200 million NOK since 1994. The main reason for the progress is probably the presence of well-organised co-operatives, which have made it possible to collect all relevant information into one database. The data is easily accessed by the farmer, the breeding organisation and by university researchers. The data has recently become more easily available for local advisers and veterinarians through the internet. Since 1984 there has been a large improvement in BMSCC in Norway. However, there has also been a large increase in the number of clinical cases of mastitis treated. This has probably been due to more treatment administered to subclinically infected cows to lower the BMSCC to achieve quality targets for additional payments. This led to over-treatment and excessive cost. To avoid this, treatment protocols for mastitis therapy were introduced during 1995/96. This involved a more restrictive use of antibiotics, especially during lactation. Instead of treating S. aureus infected cows immediately, subclinical infections were only treated at drying off. In addition, cows with high SCC that are judged as non-responders to therapy are assessed for culling. This part of the programme will dramatically reduce the prevalence of chronically infected cows, which also are risk factors for the development of penicillin resistant bacteria . The health periodical presented to farmers and advisers is the key tool at herd level to formulate the correct control programme. The new infection rate, duration and prevalence, as well as economic estimates of total mastitis losses in NOK per litre of milk delivered, is presented every second month to avoid over-treating cows and also to avoid excessively intensive culling strategies. To breed for resistance to mastitis and to improve the cow's ability to cope with mastitis (long term effect). These goals were achieved within three years and after ten years there has been more than a 50% decrease in mastitis in Norwegian dairy herds. Heringstad et al. illustrate that the genetic improvement of Norwegian cattle has been 3% per unit in 10 years. This means that of 0.15 (decrease from 0.35 to 0.20), 0.03 can be attributed to the effect of the breeding programme. This is 20% of the total reduction of 173 million NOK, or 35 million NOK. A BVDV infected herd will show a 7% increase in the loss due to mastitis due to the introduction of BVDV . Twenty-five per cent of Norwegian herds were infected with BVDV in 1994 compared to none in 2004. BVDV control contributed three million NOK and the remaining 135 million NOK (173 minus 38) was associated with attitude changes, improved treatment strategies and better mastitis control due to a better information system. Information technology involving co-ordinated data and modern epidemiological research is an important tool when trying to control mastitis. The constraint now in Norway is to teach farmers, veterinarians and advisers to use all of the available information in the correct way. One main goal is to implement selective dry cow therapy throughout the country. By treating only 9% of the cows, and culling chronically infected cows with a high SCC, the incidence of CM is expected to be reduced by an additional 15% . Research from the Norwegian breeding programme has proven that selective breeding for mastitis resistance is beneficial. Research has even shown that putting maximum weight on resistance to CM could reduce CM by another 10% per unit within five cow generations . Mastitis has to be included as a part of total herd health management. There are relations between different diseases. However, the same risk factors might have different influences on different diseases. Finally it is the farmers' responsibility to implement a control programme and this demands motivation. New research from Norway illustrates that there should be put more emphasis placed on heifer environment  as well as feeding strategy around and before calving . Teat dipping should be implemented in herds with S. dysgalactiae problems, but not in herds infected with S. aureus . Good mastitis control depends on good management practices at farm level, which have to be run by the farmer.